This post is dedicated to my Aunt Lynn, who never leaves home without her trusty container of Old Bay. Tonight, being a native Baltimoron, having recently returned from the beach, and in a summery state of mind, I wanted a Old Bay-flavored – but not necessarily a seafood-inspired – meal. And as you may have noticed, when I don’t know what else to make, I make soup. So tonight: Old Bay Lentil Soup. Heat some oil in a large soup pot or Dutch oven, then add the onions and carrots and cook for 10 minutes, adding the garlic after 5. Add the potatoes and tomatoes and cook for another 3 minutes, then add the stock, bay leaves, lentils, and Old Bay. I have no idea if Old Bay is an acquired taste or not, so if you’re not already a fan of it and 2 tablespoons sounds like a lot to you, add it in small doses, tasting it as you go along until it’s to your liking. I really probably used more than 2 tablespoons. Also, Old Bay is quite salty so don’t salt the soup until the Old Bay is at the level you prefer. Bring to a boil, reduce heat, cover, and simmer for half an hour. Meanwhile, admire my beautiful, not-quite-baby rainbow chard: smaller and more delicate than most bundles of chard and even more delicious. … then cover and simmer another 15 minutes or until done, adjusting the seasonings if necessary. Serve with more Tabasco and a squeeze of lemon if desired. As lentils are one of my most favorite foods and Old Bay one of my most favorite flavors, this was a real winner, and was quick and easy to boot. A great, simple summertime meal for a work night. We’re back from the beach! 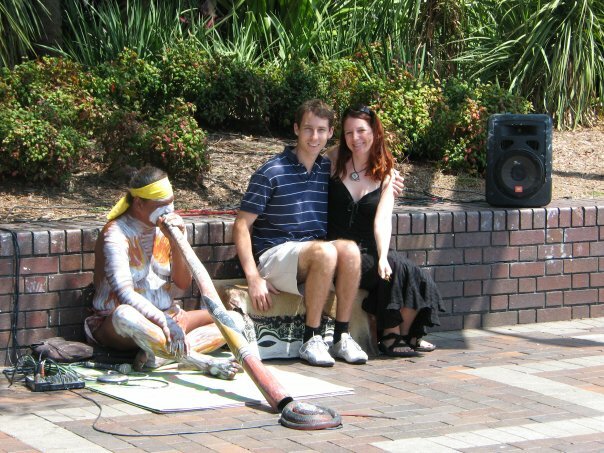 Although now Mark wants to move to Charleston…. 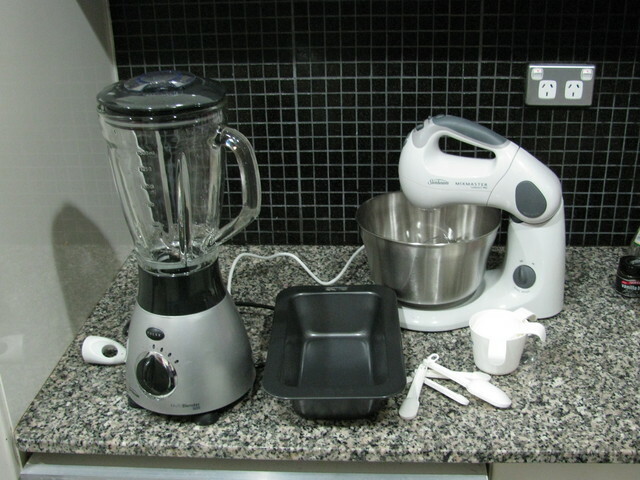 … then drain and rinse under cold water to stop the cooking process. 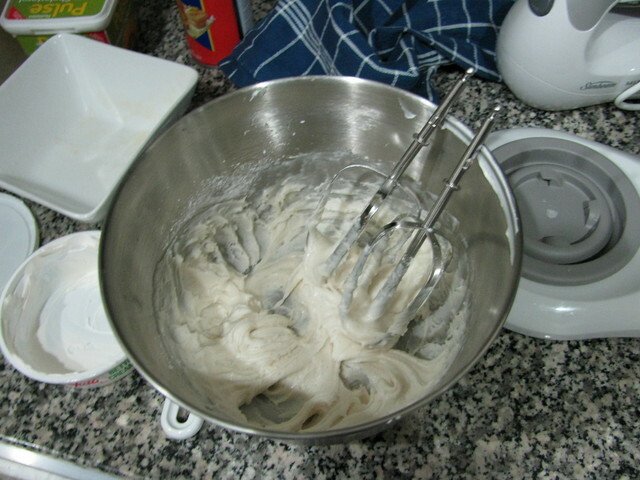 Whisk together the remaining ingredients in a small bowl. … and toss with the dressing. Serve warm, room temperature, or cool. Then I whisked together a tablespoon of German mustard, a half tablespoon of soy sauce or Braggs liquid aminos, and a teaspoon of apple cider vinegar. I topped each slab with a slice of vegan “cheese” (I used the swiss uncheese recipe from The Uncheese Cookbook). I also put a dab of habanero sauce on each slice. I tried heating up the sauerkraut to serve it warm, but decided it tasted much better cold, which meant it was raw and probably even healthier. Mark made a sandwich out of the tempeh and sauerkraut and some rye bread; I served mine without bread. Mark’s meal was probably a little better, though, because the tempeh was a little dry: smooshing it together with the sauerkraut probably improved it. What Mark had, therefore, was a super-healthy reuben, minus the fattening Thousand Island sauce! As promised/threatened, I have some travel photos. Mark’s mom arranged a salt marsh tour for us and it was rife with photo ops. This is the Morris Island lighthouse. There were a lot of birds on the island we stopped to explore. This guy didn’t budge regardless how close I got to him and had what I thought was a funny expression on his face. My college roommate’s father was an artist who named all his works “Sentinel”. I named this photo “Sentinels” in his honor. This one is facing the wrong way! This one is a loner. I identify with him. These pelicans didn’t let me disturb their wading. 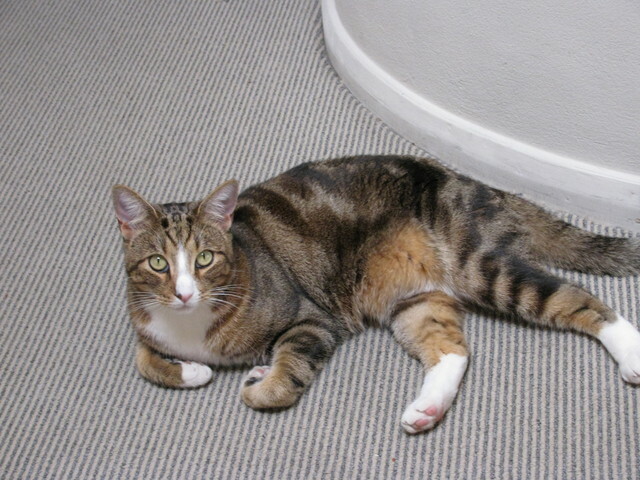 He ran away from me – sideways of course! – as fast as he possibly could (which is quite fast), but he needn’t have worried because I haven’t eaten a crab in more than 20 years! I never knew what oysters looked like in the wild. In fact, I’ve never even eaten an oyster and don’t even know what they look like on a plate! You can’t really tell from the photo, but the fin in front of the mama dolphin belongs to a baby! And that’s how I spent my week at the beach: hanging out with dolphins, swimming in the ocean, reading, enjoying the company of Mark’s wonderful family, reading some more, and swimming some more. Pretty idyllic, really. It was sunny and hot in Charleston, and at an amazing 83 degrees, the ocean temperature was a good ten degrees warmer than the water in my pool when I left it. When I got home, I found the pool had actually also warmed to 83 degrees, which was nice. What was definitely NOT nice was that the filter broke while we were gone and my pool was a green, swampy – but finally temperate – mess. So while I thought I’d spend my transition day from vacation to work week poolside, what instead transpired is I spent an hour cleaning the pool, which I couldn’t get in, and then it rained and was overcast all day anyway. Yeah, hello, Virginia. Can’t say I missed you or your lousy excuse for a summer. In happier news, however, Miss Brachtune missed the heck out of us. She hasn’t left my side for 24 hours. I’ve never seen a cat so incredibly happy to see a human being before. And she’s doing great! The cat sitter said she was a perfect angel when getting her sub-q fluids and she seems to have eaten pretty well, and she just looked healthy. So that was a relief! And now I guess I have to confront the fact that I need to be at work in 10 hours. I did realize today that thanks to the Fourth of July on Saturday, I have a 4-day work week – woo! I know I said not to expect me to post for a couple of weeks, but I found time to make a quick dinner tonight, so here you go. Korean rice cakes may not be for everyone. Completely unlike the crunchy styrofoam-like health food snack that no one likes but Mark (who will eat anything with the word rice in the name), they have a texture that puts some people off, including myself to some extent. I don’t like overly chewy things because I have bad dreams involving chewing gum and my teeth (which is why I don’t chew gum). Rice cakes are about the limit of chewiness I can tolerate. Mark loves them, however, and I like the spicy sauce they are served in. The first time I tried to make this, I overcooked the rice cakes. NEVER overcook rice cakes. Err on the side of undercooking! The reason I didn’t make an Irish meal in celebration of Bloomsday is because we’re leaving for the beach on Saturday and I will likely not be cooking any more meals between then and now, so I’m not hitting up the grocery store for any fresh food and am eating what’s on hand. Ordinarily, I’d have used fresh ginger and added scallions to this dish, but again, I’m a lacking some fresh supplies. Bring a medium large pot of water to a boil and add the rice cakes, stirring so they don’t stick. How long it takes to soften them depends on the size and shape of the rice cake, but will probably only take a minute or so, so don’t walk away from them. Slightly undercook them because they’ll be further cooked later. When they are soft enough to chew, drain and rinse with cold water. Prep the cabbage, onions, garlic, and scallions (if you have them). Mix the gochujjang, soy sauce, garlic, ginger, sesame oil, red pepper flakes, and sugar together in a small bowl. Stir the soy sauce or vegan “fish” sauce into the water. Heat a wok over medium high heat and add some oil. I used canola plus a bit of the toasted sesame oil for flavor. When hot, add the onions and cook for a minute or two. Add the cabbage and cook for 30 seconds. Pour in the water and soy or “fish” sauce and bring to a boil. … then stir to combine. Bring to a boil and simmer for a couple of minutes, until the sauce begins to thicken. If your rice cakes are sticking to each other, run cold water over them while rubbing them apart from each other. When they are all free from each other, dump into the wok. Bring the sauce back to boiling and cook just long enough to heat the rice cakes and thicken the sauce. The sauce should be sticking to the rice cakes. Do not overcook! Stir in the scallions and remove from heat. These must have been good because Mark informed me he would be taking the leftovers in for lunch tomorrow and he never takes lunch in. I had a fresh block of tofu that I made yesterday and knew I probably wouldn’t be able to use it any other night this week, so I whipped out The Book of Tofu, figuring if the answer to “what’s for dinner?” wasn’t there, it wasn’t anywhere. The Book of Tofu is rather Japanese-centric, so the Chinese recipes it contains are mostly Japanese twists on Chinese recipes, which is why you’ll find sake in an otherwise rather Chinese meal below. I changed the recipe up, though, making it more authentically Chinese, so I probably should have swapped the sake out for shaoxing wine, but what the heck. It turned out well, it was quick and easy, combined flavors I love, and I’ll definitely make it again. But like my Japanese-type American-style Pickles, I seem to be making sort-of cross-culture foods lately. Which is a-okay with me. In a small bowl, combine the fermented black beans (you can rinse these first to make them less salty, but I prefer not to), soy sauce, and wine. 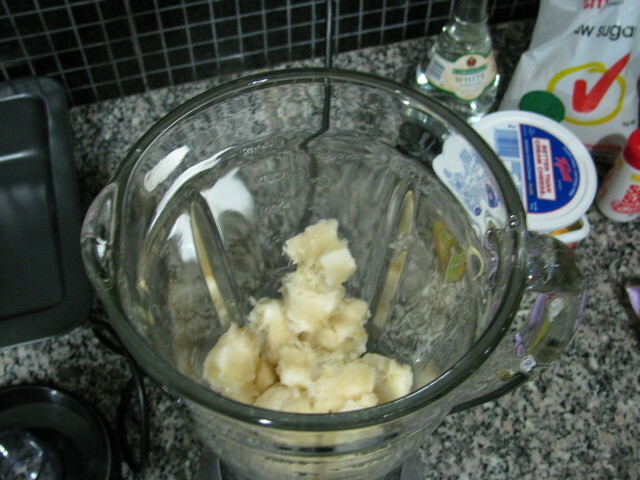 Chop the tofu into 3/4″ squares. Mince or press the garlic, slice the onions, and chop the tomatoes into wedges (make them thicker than I show here because mine cooked down too quickly). When ready to cook the meal, heat some oil (I used peanut) in a hot wok. When hot, add the onions and stir fry for a minute. Add the garlic and stir fry for 30 seconds. Add the tomato wedges and stir fry for a minute or two. Add the fermented black beans, soy sauce, and wine. If you can’t find or don’t have fermented black beans, you can just omit them and maybe add a little bit of vegan “beef” boullion, which is a totally different flavor but will give the dish a similar flavor boost. Try to find fermented black beans, though, because they are really, really good. Stir in the tomato sauce and chili garlic sauce, adjusting for the amount of heat you like. I used about 2 tablespoons and Mark added hot sauce to his plate and I regretted not adding a little more. We both really like heat, though. … and the peas or edamame. I think edamame would have been awesome here, and I sometimes have frozen edamame on hand but was sad to discover I didn’t have any tonight. Stir the cornstarch mixture into the wok and stir for a minute or two until mixture thickens and becomes a bit glossy. Every ingredient in this dish is a favorite of mine, so this was a no-brainer! In other news, I GOT IN THE POOL yesterday. The water was a bit cold upon first contact but I was determined to go swimming, and it wasn’t at all bad after the initial shock. Despite this happy news, the forecast for this week is yet more cooler temperatures and even more thunderstorms. I can’t believe it! It’s supposed to be in the SIXTIES on Wednesday. What kind of horrible summer is this? Also, I have a busy week ahead of me and then Saturday morning Mark and I leave for our annual Beach Week with his family in Charleston, South Carolina, which I am looking forward to (the beach there is really nice and I also love Mark’s family). There’s no internet at the beach, so you may not hear from me for a couple of weeks, but don’t be alarmed. I’m just relaxing and probably taking a million pictures I’ll later subject you to, some of which may involve food. Mark’s family contains several vegetarians and is extremely accomodating of vegans. I took Brachtune in for a check-up in anticipation of leaving her alone for a week, to make myself feel better, and the vet called Friday to tell me that according to all the tests they ran she’s doing “amazing”. Which didn’t surprise me at all because Brachtune has been acting nothing at all like a 17-year old cat who probably has cancer: she’s been acting like a little ole hunk of purring love. 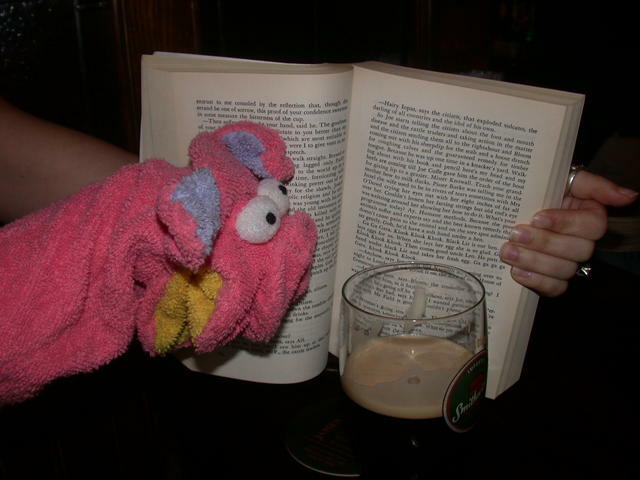 Also, tomorrow (Tuesday) is BLOOMSDAY! So read some of Ulysses (I’ve downloaded it to my phone for free!! 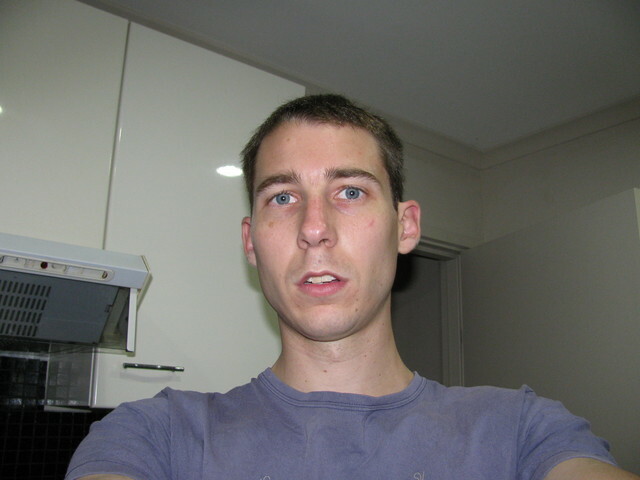 ), drink a lot of beer or whiskey, and act real pretentious! 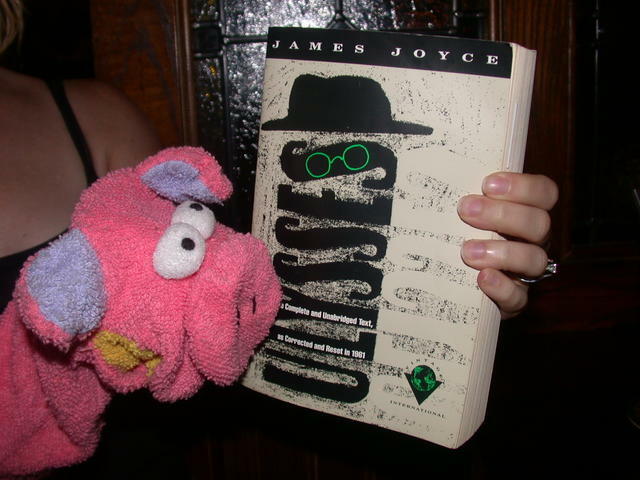 Here’s Pig checking out his copy of Ulysses during Bloomsday 2004: the centennial! While stocking up on one of my favorite ingredients, lentils, the other day, I came across pardina lentils. I didn’t know what they were at the time, but grabbed them anyway, later learning they are Spanish lentils, somewhat smaller and greyer than your basic brown lentil, that keep their shape, similar to French lentils. In fact, after having eaten them I can say they are somewhat like a cross between brown lentils and French lentils. I’m sure I would have found something to do with them, but I decided to just make the recipe on the back of the package, and it turned out well. Note: I didn’t have any soyrizo on hand, but I did have Italian-style vegan sausages. So I used those and to the spices above added: 1 pequin pepper (a very hot dried pepper), 1/2 tsp ancho chili powder, and 1/2 tsp smoked paprika. Bring a soup pot to temperature over medium heat. Add some olive oil, then add the onions and green pepper and cook until soft. Add the garlic and spices and cook for one minute. Add the tomato sauce and cook for another minute. Add the broth, lentils, and chorizo. Bring to a boil, then reduce heat and simmer for 40 minutes or until lentils are soft, then remove the bay leaf. An easy, quick, cheap, filling, simple meal. Good for the 106th straight evening of thunderstorms we’ve endured. Seriously, I love thunderstorms, but this is getting ridiculous. Last weekend I got on the pool, but I still haven’t gotten in the pool. I floated around on a raft last weekend, reading, but when I stuck my arm in the water, it went numb almost instantly from the cold. Fortunately, although it’s been stormy nearly every day, we did get a few warm days so the water temperature is rising, but the forecast just calls for more thunderstorms and cooler-than-normal temperatures, all of which is wreaking havoc on the pool and driving me crazy! I’m battling algae, which has never been a problem for me in the past, but it’s hard to take care of the pool when there are storms every single night and pool maintenance requires sticking a long metal pole into a large body of water, which I think is a recipe for exactly what you are NOT supposed to do during a lightening storm. Sigh. Hello, summer? Come in, summer? Where are you, summer? I’m a big fan of tsukemono, or Japanese pickles. Actually, I’m a fan of pretty much anything pickles. But particularly Japanese pickles because they are often quick to make and quite tasty. I have a couple of tsukemono books and this recipe, from Quick and Easy Tsukemono, called Kyuri Amazu-ae, or Sweet Cucumber Pickles, is purported to be “a Japanese version of Western dill pickles”. It also says it reduces “spices and sourness”, although in my opinion, though it doesn’t contain dill, it tastes very much like an American pickle. And therefore happens to taste awesome. I tripled the original recipe. If you want to just try it out before making a large batch, feel free to halve or third it. If you have a scale, weigh the cucumbers. When I’m gathering weights for salt percentages for fermentation, I tend to use grams, although it doesn’t really matter what scale you use. Slice a sliver off the end of each cucumber. I did this on both ends, but mainly you’re concerned about the blossom end, which contains enzymes that can cause softening. Slice each cucumber in half lengthwise. Place the cucumbers in a pickle press if you have one, or a crock into which you can fit a plate and a weight. Stir the salt into a cup of water. Pour the water over the cucumbers. Apply the lid of the pickle press and screw as tightly as you can. Alternatively, place a plate on top of the pickles and add a weight to press them down. Let sit for 12 to 24 hours. The water level is higher because water has been extracted from the cucumbers. Drain the cucumbers and rinse well to reduce saltiness. Place all of the remaining ingredients into a saucepan and bring to a boil. 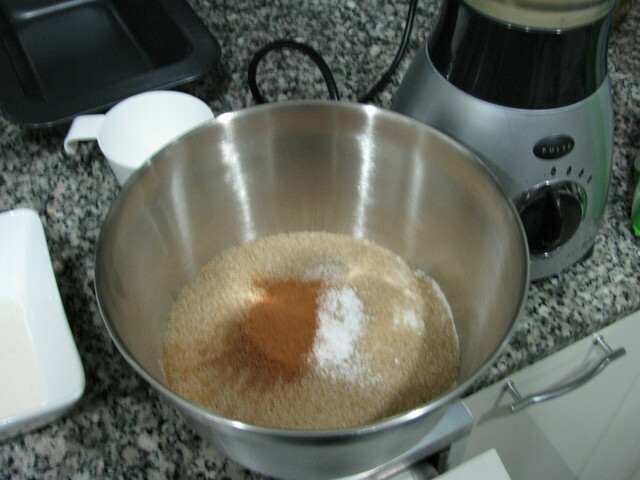 Simmer until the sugar is dissolved and then allow to cool. Place the cucumbers into sterile jars and pour the marinade over them. Top off with water if necessary. Refrigerate. The pickles will be ready the next day and keep for several months. The book says they keep several months at room temperature, but I would and do refrigerate them. The Japanese are fond of eating pickles with both rice and beer, and I can attest both are fine choices. I always add a tsukemono or two to my Japanese-themed meals. This particular pickle, however, is particularly fine with just about any meal and is shown here with the rather American veggie burger. I love their description of their German-style sauerkraut: “Versatile pickle you can fix with in ’emergency'”. It’s hilarious on so many levels. First off, what exactly constitutes a pickle “emergency”? I’d imagine it involves a friend unexpectedly showing up at your doorstep in dire need of a beer and pickle. What’s strange about this, though, is the books contains many – in fact, mostly – so-called “instant” pickles: those that are ready within an hour or so, all of which would be much more effective at relieving a pickle emergency than sauerkraut, which according to the book takes at least a week and according to me takes at least three weeks. Second of all, what does “fix with” mean? And thirdly, why is “emergency” in quotes? Mostly, though, I love this quote for introducing me to the concept of a pickle emergency, which is something I encounter a lot around here because we’re always running out of them. In other news, Brachtune saw the vet today and I was extremely pleased to learn she’s gained half a pound. She still weighs half as much as she used to, but when you are six pounds, gaining half a pound in two months is GREAT, so I am very, very happy. For a kitty who is very close to or possibly more than 17 years old, and who might have cancer, The Toonse is doing very well. And therefore, here is a picture of her enjoying great dinner party conversation the other night, when I served an Ethiopian feast and managed to not take any pictures other than of the cat and my friends wearing tiny top hats. Note from Renae: one of my best friends in the world, whom I recently visited in Sydney, surprised me tonight by sending me a guest post! This is shocking because he’s a meatatarian…and didn’t even own a decent kitchen knife when I showed up at his doorstep. But I think you’ll agree after reading his post that he’s making huge, delicious strides in the way of vegan eating and cooking, and in fact, I’m hosting a small dinner party this weekend and now I’m planning to make Smucky’s banana bread for dessert! And with that, allow me to introduce Smucky! Hi, everyone, welcome to my guest post! My name is Mark, but Renae Myers usually refers to me as Smucky, or Smuckalert. This is me pictured below, with my sous chef Max Powers below. 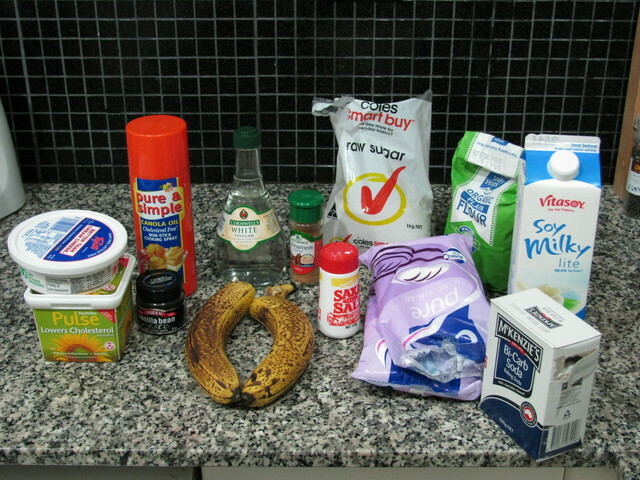 The products pictured are all available locally here in Australia. Note that you guys call bi-carb soda baking soda apparently. Also, my vegan friend (who is also American) told me that vanilla paste is unavailable there, so instead you need to use vanilla essence or something like that. I know the bananas look like they’re past their prime, but this is how they’re supposed to be for banana bread. 3. 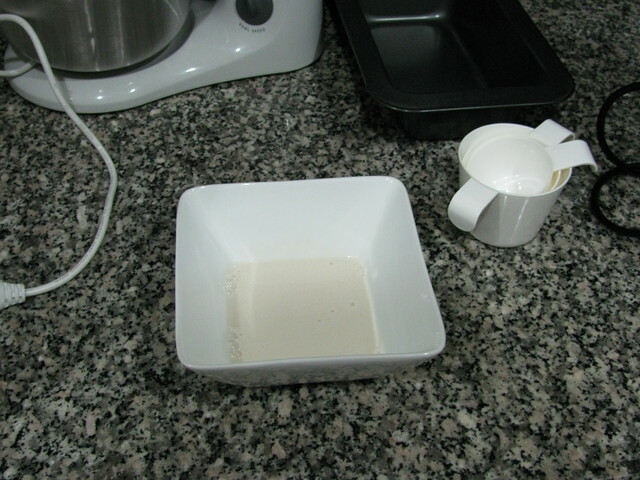 Combine the 1/4 cup soy milk with 1 tsp of vinegar into a small bowl. Note that I used “light” soymilk – a health-conscious move that is nullified by the unruly amounts of sugar that go into this. * Based on events that never actually happened. 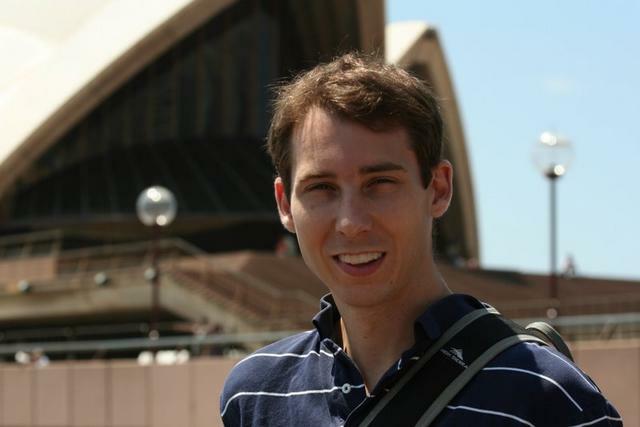 You can tell from the Opera House in the background! I’m super excited Smucky hosted another food-loving friend – who amazingly happens to be vegan as well – shortly after I left in March, because now he has all these fancy new kitchen appliances I can play with the next time I’m there. Hell, his oven didn’t even work when I was there! And I had to buy him a knife! 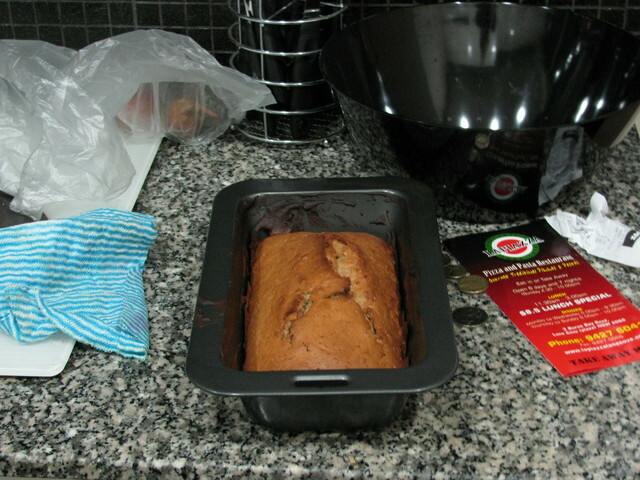 Anyway, try Smucky’s banana bread: if it’s vegan and Smucks will eat it, it MUST be good! I don’t have a big drawn-out recipe for you tonight, but my quickly thrown-together dinner turned out so well I photographed the result and figured I’d post it. I had homemade tofu I needed to use up, so as usual I asked Mark what he wanted for dinner, but this time restricted it to tofu. He said he wanted tofu and rice, and when I asked what kind of rice, requested sushi rice, “the best kind of rice”. So, thinking in vaguely Japanese terms, I threw together what I ended up calling Tofu Mark. Maybe it should be Tofu Mark-san. Prepare the sushi rice. I cook mine in a rice cooker. When it’s done, I cut in a little bit of salt and about a tablespoon of sushi vinegar (or rice vinegar with a bit of sugar). 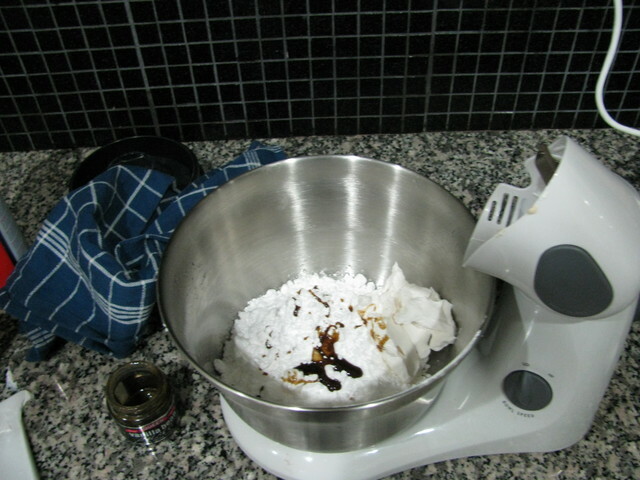 Whisk together the chili paste, soy sauce, garlic, mirin, and sesame oil in a small bowl. Set aside. I won’t actually require you to use homemade tofu for this dish, but I will emphatically ask you to. I haven’t had commercial tofu in a while, but upon eating this tonight, I remembered why that’s the case! Homemade tofu is a million times better than store-bought! In any case, chop it into a 3/4″ dice, then toss with the cornstarch. Heat a high-smoke-point oil in a wok or large skillet over medium high heat. Add the tofu and allow to brown on one side before stirring, then stir and continue to pan-fry until golden on all sides. Pour the sauce into the wok or pan and stir to coat the tofu. It should immediately thicken. Remove from heat. Serve with rice. You can sprinkle with sesame seeds if you like. I intended to and forgot. Good with steamed broccoli and some Japanese literature. I was reading Haruki Murakami, although his characters are always eating spaghetti and other Western food instead of traditional Japanese food! I don’t even know if he realized it, but I was feeling a little blue today until Mark met me at the front door with not one but two bouquets of flowers when I got home from work. Do I have the best husband or what?! That thing hovering above the flowers is Fang, our bat. We got him in a hurricane. Long story. Here’s my dinner table tonight. The only thing wrong with it is the fact that I’m able to put those flowers on it. Were Tigger here he’d have knocked them over to drink the water out of the vase. I’m always discovering things I can do now that Tigger’s not here, but I’d rather have him back in a heartbeat than be able to leave glasses of water lying about. First of all: it’s my father’s birthday. 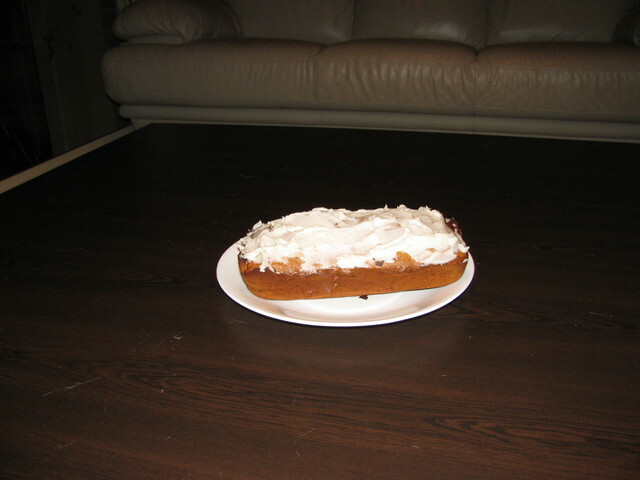 So, Happy Birthday, Dad!!! If we lived closer, I’d have made you something nice to eat for your birthday! Second of all: IT WON’T STOP RAINING. It’s relentless. And really annoying because we have a pool and I spend a lot of time and money on its upkeep SO I EXPECT TO BE ABLE TO SWIM. No such luck so far. We don’t have a heater, either, so I’m very sensitive to the ambient temperature. I’m not sure it made it above sixty degrees today. I get several alerts from NOAA about storms in our county every day. Yesterday afternoon I was warned simultaneously to expect: severe thunderstorms, hail the size of pennies, gusting wind, flash floods, AND tornadoes. When I told Mark of this he asked what they’d be warning me of next: a plague of locusts? I wouldn’t have been surprised. This has been the lousiest start to summer I’ve ever seen! Flipping through the cookbooks I checked out of the library for dinner tonight, though, I found the perfect meal: Rainy Day Vegetable Cobbler, in Lost Recipes by Marion Cunningham. Guaranteed to cure my rainy day blues, it said. Since I have those blues big time, I made the cobbler. And I share with you. It was vegan as written other than the chicken stock and butter, neither of which I even read as non-vegan because they are so easy to sub for. I did, however, healthify it for you. The original called for what seemed to be a ton of butter. Prepare all of the vegetables and place in a large baking dish or casserole. Whisk the cornstarch into the stock. Don’t be confused that I am only showing one cup of stock here; you really want three. The original recipe called for one cup, but after getting off the phone with my father and checking the casserole’s progress, I realized it contained far too little liquid and was drying out, so I added more. Don’t make my mistake. I make all the mistakes for you! Pour the stock/cornstarch mixture evenly the vegetables and toss with the salt and pepper. 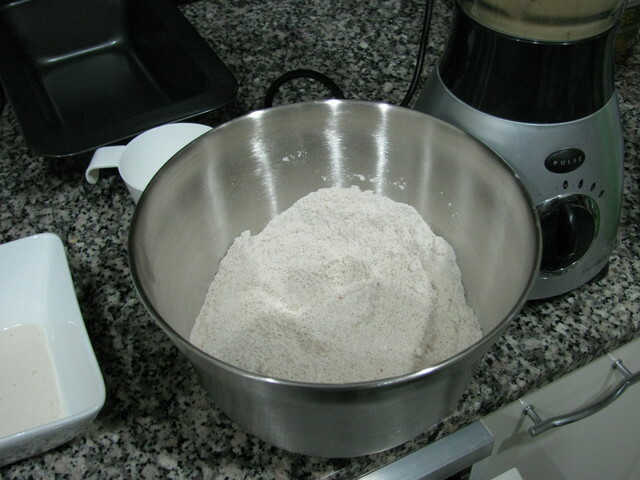 In a large bowl, whisk together the flour(s) and baking powder. 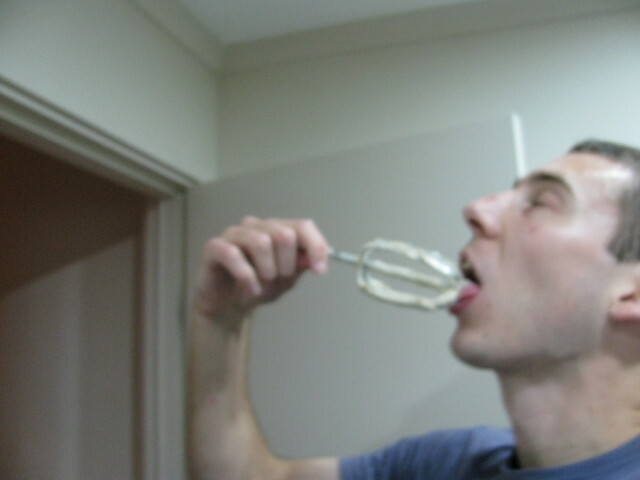 … and whisk or stir with a fork until crumbly. 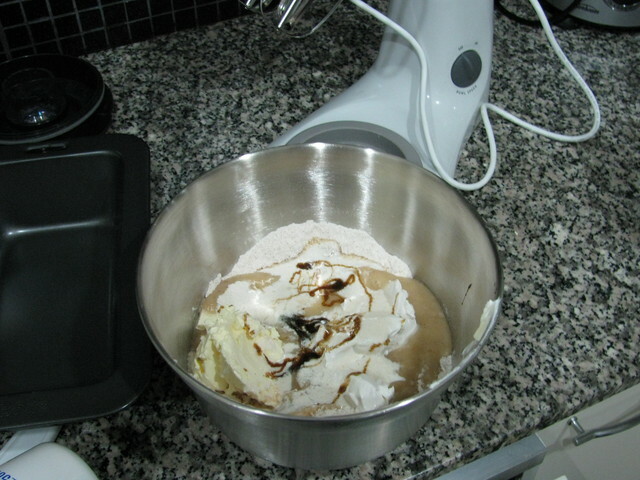 Add the cream and combine until a messy but cohesive ball. It’s easiest to use your hands. 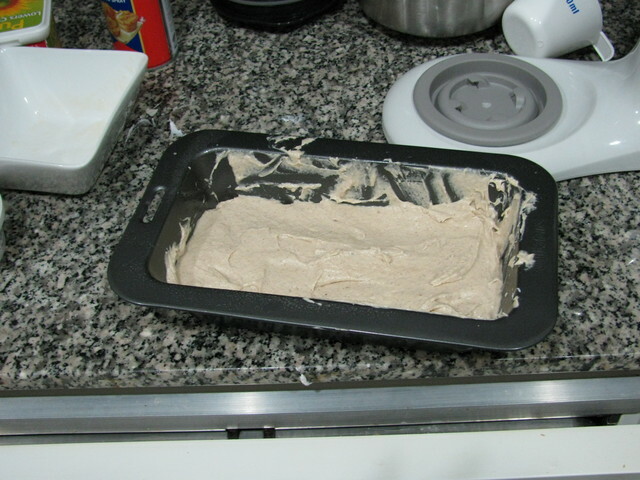 Roll the dough out to roughly the size and shape of the baking pan and about 1/4 inch thick. Place on top of the vegetables. My thoughts on this are it didn’t thicken up enough. 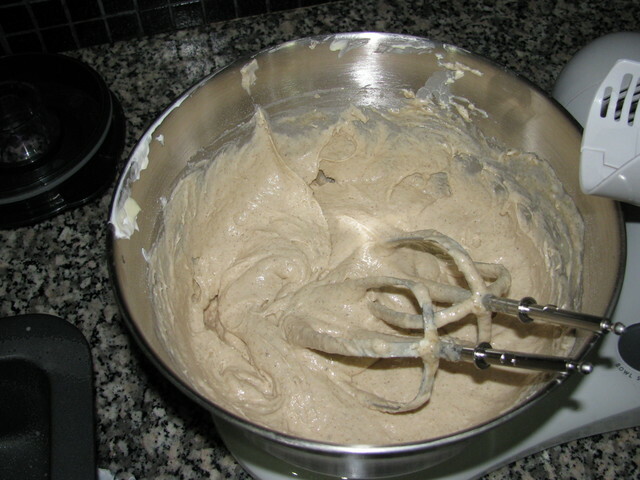 I’d have used a roux instead of cornstarch. 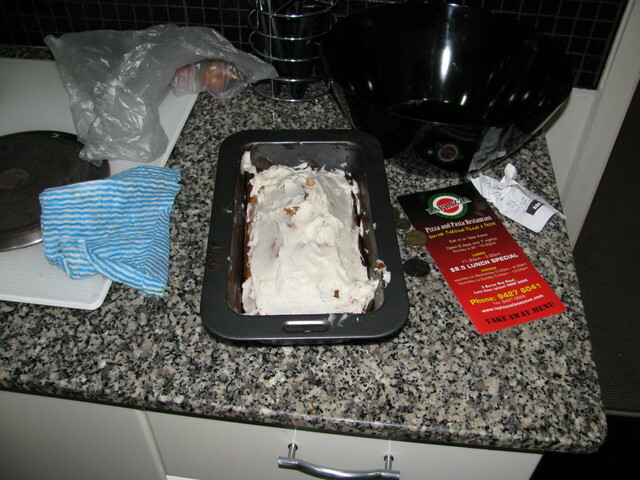 I wouldn’t have felt guilty either, considering I cut the margarine down by 80%. (I can’t even IMAGINE eating it with all the fat it called for! It’d have been incredibly greasy and rich!) It really should have been more pot pie-y and less soupy. When asked for his opinion, Mark said it was really good. When I countered that it was awfully soupy, he responded that the soupiness gave it a “what do you call it, a je ne sais pas”. Which I think was him being kind. Later he said he loved the crust best and the vegetables second. I’d make it again: it was quick and easy and although I don’t like making pie crust, this cobbler crust was easy, but I’d definitely make a much thicker gravy. The original did call for 1/2 stick of butter to be dotted onto the vegetables before adding the crust (which itself called for 3/4 stick of butter), but I don’t think adding all that butter would have thickened it up. It definitely needs a roux. Nonetheless, it was tasty and although it didn’t actually cure my rainy day blues (nothing but sunshine and 90 degree temperatures is going to do that), it was a filling meal. Maybe the soupiness of this cobbler represents the soupiness of my muddy yard. Or my non-swum-in pool. I realize I’ve been a little heavy on the commercial fake meat lately, and I feel bad about that. It’s really not all I’m eating! I was going to do a huge, beautiful Ethiopian post yesterday, in fact, but my injera turned out bad. Real bad. So bad Mark and I got sushi for dinner instead. (All the wots and wot-not (har har) went in the freezer until I can get to the Ethiopian grocery this weekend and buy injera because I’m feeling gun shy about making it. I will try again at some point, however.) Last week I was just playing around with the fake meats I found in the Vietnamese grocery store. This week I’ve been looking at more “old time” recipes in cookbooks borrowed from the library. I usually keep a stash of vegan ground “beef” or “hot dogs” on hand for nights when I don’t have time to make a real meal, although often I find that they pass their expiration date before I get around to needing them. So tonight’s meal uses up some such packages. The recipe is an adaptation of one in Rare Bits, a cookbook that explores the “forgotten” origins of popular recipes. According to the book (which is really pretty interesting), the vendors at Coney Island didn’t like the association to dog meat the term “hot dog” brought to mind and refered to their weiners in rolls as “Coney Islands” or “Red Hots”. This is my vegan version of the recipe found in the book, scaled to make two “dogs”. Set aside 3 tablespoons of the diced onions. Heat a small skillet over medium heat. Add a small amount of oil. When hot, add the rest of the onions and the garlic. Add the “ground beef” and cook for 2-3 minutes. Add the tomato sauce, water, chili powder, salt, and pepper. Bring to a boil, reduce heat, and simmer until thickened, about 10 minutes. Meanwhile, prepare the hot dogs according to package instructions. I cook them on the George Foreman grill. Here they are probably overcooked. Place a cooked hot dog in a bun. Top with half the chili. Top with half the reserved onions. I served with a tossed salad (not shown) and Boston baked beans. I cheated on the beans, which also make me feel bad. Instead of using dried beans, I used a can of small white beans. I didn’t measure, but I added 1/4 onion, a pinch of cloves, dry mustard, 2-3 tablespoons tomato sauce, some molasses and brown sugar, and salt and pepper, topped off with some water, and simmered for half an hour or so. The Toonse helped me eat. She loves books as much as I do, although her preference is more to rub her face on them than to read them.